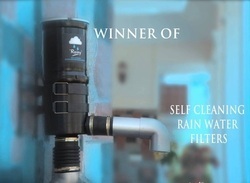 We are a well established trader and distributor of Online Rainy Filters. Highly known for their segregating dust particles from water, high efficiency, easy installation and compact design, these filters are procured from the reliable vendors of the market who make use of latest technology and high grade material to manufacture them. Our offered rainy filters find wide application in domestic, commercial as well as industrial sectors for pure and efficient filtration of water. 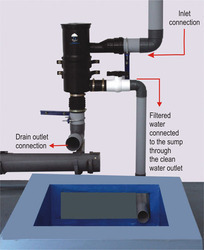 Further, designed with a self cleaning cleaning mechanism, these filters can easily fix to the wall by connection with rooftop rainwater pipes. It is unmatched in performance and provided to our clients at most competitive prices. With highly enriched industrial experience, we have been offering our clients with a wide spectrum of quality assured Rain Water Filter. These devices are procured from the reliable vendors, who manufacture these products in complete compliance with defined industry standards. Further, designed to perfection, these Filters and first flush devices find wide application in domestic, commercial and industrial areas for hassle free discharge. Customers can avail these products at market leading prices. 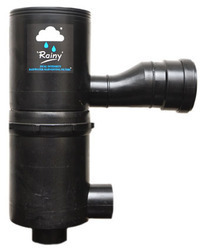 `RAINY’ First of its kind Dual Intensity Rainwater Harvesting Filters with self cleaning and auto flush out arrangements. RAINY’R Dual Intensity Rainwater Harvesting Filter™ is the result of over 10 years Continuous R&D done by the team of FARMLAND RAINWATER HARVESTING SYSTEM, by studying the pattern of rain fall in rural and urban India, intensity of rainfall, type of houses, pipeline used for rainwater outlets, re utilization, recharging of ground water and Tube well etc. In the past decade we have witnessed phenomenal changes in global weather patterns. The unpredictable and erratic weather patterns have resulted in torrential down pours and rainfalls of very high intensity. 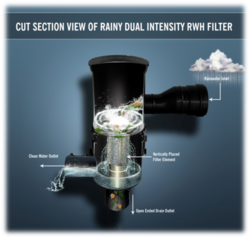 These heavy duty Dual Intensity Rainwater Harvesting filters are so designed; keeping in mind the capture of rainfall loads varying from 5mm to 75mm/hour without affecting the efficiency of filter and the operating required less than 0.06 kg/cm2 (2 feet) so the filter can perform even in low Roof areas. The design, stability and filter function efficiency is directly proportional to the intensity of rainfall. Different models of filters were set in place to capture rainwater from varied rooftops. This brought in affordability, to all cross sections of households and Industry. The characteristic features of FL Series Dual Intensity RWH Filter is its capacity to take up the load up to 10 to 500 square meters of Roof area with variable intensity of rainfall of 5 to 75 mm/ hour with a discharge capacity of 10 To 480 Liters per minute. 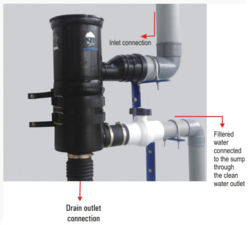 This filter can be conveniently used for Harvesting Rainwater for apartments, Institutions, Hospitals, Commercial Buildings, Industries, Corporate houses of Medium and large sizes. With highly enriched industrial experience, we have been offering our clients with a wide spectrum of quality assured Filters & First Flush Device. These devices are procured from the reliable vendors, who manufacture these products in complete compliance with defined industry standards. Further, designed to perfection, these Filters and first flush devices find wide application in domestic, commercial and industrial areas for hassle free discharge. Customers can avail these products at market leading prices. Ø Coconut Shell Activated Carbon removes foul odour. Ø Removes Flourides, Arsenic , Lead , Mercury etc. What makes DOLPHIN UF different from others?? 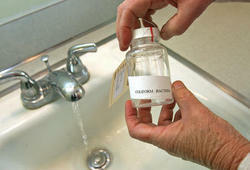 Ø Removes not only Bacteria but also viruses. Ø Dead end device - not a single drop of water is wasted. Ø Easy, Self maintenance. Doesn't take more than 5 minutes. Ø Removes complete Turbidity to produce crystal clear water.